Home, if nothing else, should be a sanctuary where we can escape the frenetic pace of modern life and recharge for the challenges we face with each new day. Some people have interpreted that to mean that once we’re inside our homes, nothing should stand out visually and that serenity is best achieved in neutral colors that don’t vary much from one to the other. At Design NJ, we encourage you to create homes that make you happy. If white on white is your favorite color combination, go for it. But it’s also important to understand that strategically placed spots of color — even pastels — will create visual depth by leading your eyes through a room in a way that monochromatic furnishings will not. For the more daring among you, bold color — used wisely — will energize a room. Imagine the lively conversations in the yellow and silvery dining room designed by Valerie Grant and featured on the cover of our June/July 2018 issue. Photo by Peter Rymwid. The secret to using color involves not only knowing which ones mix well, but also in knowing when to stop. You’ll get all sorts of ideas in our June/July issue. Also look for the latest in outdoor furnishings and a range of other topics designed to help you personalize your home. 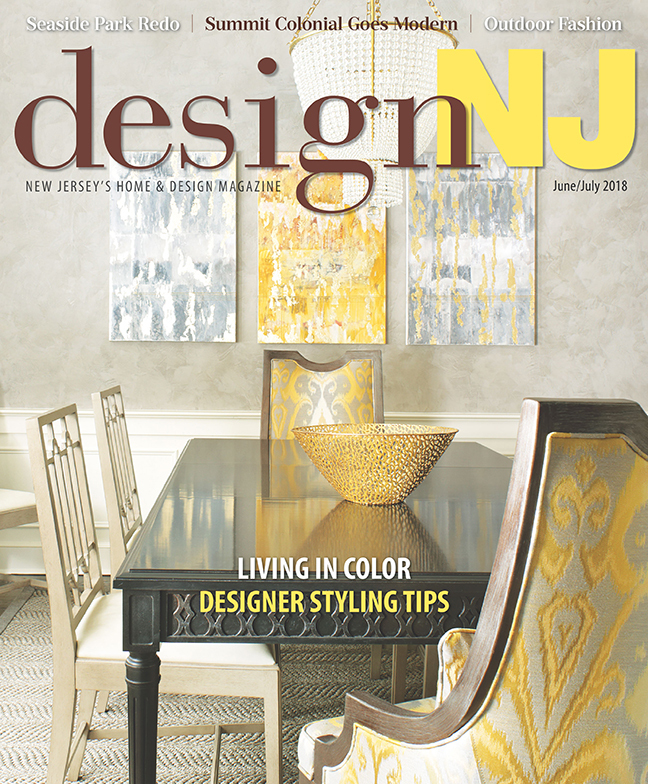 Not yet a subscriber to Design NJ ? Click here to subscribe today!